chain in your choice of length. Each item is made-to-order just for you! Alternate Bar Pendant Text: To have alternate text stamped - instead of the constellation name - please enter it here. The constellation bar pendant measures approximately 1 & 1/2-inches long (3.8cm,) and 1/4-inch wide (.64cm.) It is rectangular shaped, solid brass, and has a good weight to it. I will hand-stamp the pendant with the zodiac constellation of your choice, along with the name of the constellation. 1. Constellation and text on the same side (one side) of the pendant. 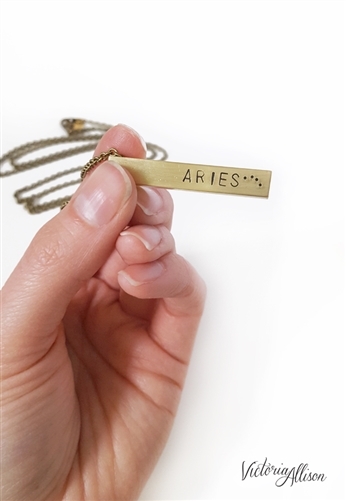 For example: The word "Aries" and the Aries constellation on 1 side of the pendant. 2. 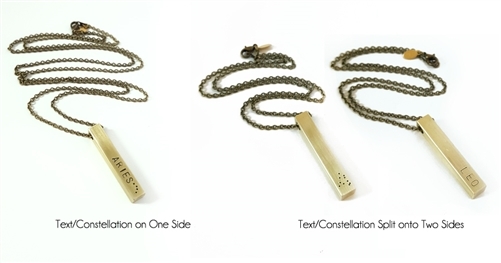 Constellation and text split onto two sides (opposite sides) of the pendant. 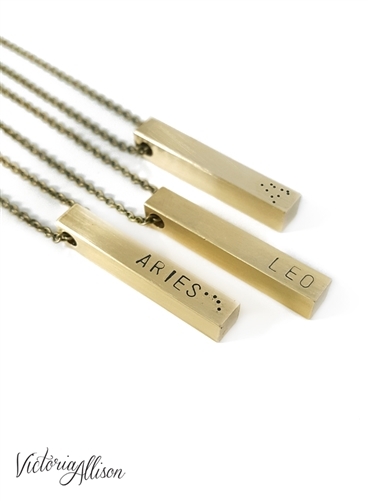 For example: The word "Aries" on one side, and the Aries constellation on the other/opposite side. Please view the photos in the listing for examples of both choices. Want a different constellation than what is currently listed, or additional text/constellations on multiple sides? Contact me for a custom order! 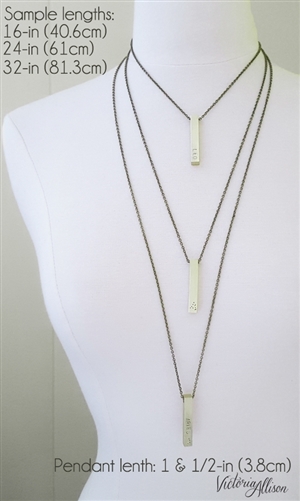 Antiqued/darkened brass chain, in your choice of length up to 32-inches (81.3cm) long. Please view the 4th photo for chain length examples. You can use a soft polishing pad/cloth [made for brass jewelry] if you wish, but do note that brass naturally oxidizes over time with exposure to air, perfumes, lotions, etc. and will develop a darker patina. I have coated the pendant in a thin layer of sealer which will help delay the patina. I recommend keeping your jewelry dry and putting it on last when you're getting ready for the day.